Now that the Verizon iPhone is here, you may be tempted to rush out and buy one, but there’s no good reason to, unless you’re extremely impatient or you don’t care that much about money. If neither of those descriptors applies to you, then you’re better off waiting. 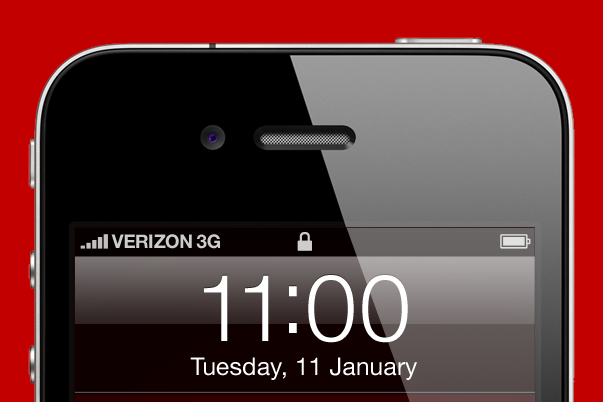 The phone that Verizon (s vz) is announcing today is nearly eight months old. That makes it a senior citizen given Apple’s (s aapl) established iPhone hardware upgrade cycle of 12 months. The next iPhone will almost certainly make its debut at the Worldwide Developer’s Conference in June, and should go on sale not long after that. There’s no reason to expect it not to be leaps and bounds better than its predecessor. More processing power, better battery life, and maybe even NFC all seem to be in the cards. Judging by the images from the Verizon announcement earlier today, Apple has indeed redesigned the antenna system that forms the outside border of the iPhone 4 for this launch. Presumably, that’s to mitigate any potential antenna reception issues. It’s a nice touch if it works, but not nice enough to justify locking yourself into a two-year contract a scant few months before a complete hardware overhaul. Verizon offers no advantage in pricing for the hardware; the 16 GB model will cost you $199 on a two-year contract, and the 32GB version is still $299. Verizon does allow the iPhone 4 to connect up to five Wi-Fi enabled devices to share its mobile network connection via Personal Hotspot capabilities. That’s a big advantage, but one that’s not going anywhere on next-generation devices. As for data pricing, that’s to be determined still, and could confer a slight advantage. If you want an iPhone from Verizon, it must be awfully tempting now that it’s here. But remember that today’s announcement isn’t a limited-time only offer; it’s not going anywhere anytime soon. And if you’ve managed to survive this long with whatever alternative solution you have been using, you can make it a few more months. Trust me, once the excitement wears off, those who waited will be much better off. Notice no data plan rates were announced. Don’t expect bargain basement pricing – and with 5 device tethering, forget all you can eat plans, which are taking their place next to the 2400 baud modem in the annals of tech history. No early upgrade plan for existing Verizon customers, either – no matter how close your “New Every Two” is due to come up. All this tells me, Verizon’s first priority is to take customers from AT&T, as well as those of other carriers who’ve heeded the incessant complaints of current AT&T customers and waited for the “best smartphone” to be on the “best network.” That’ll be enough to fuel several quarters of growth. It’ll also happily fleece overeager Apple fanboys whose patience has been overly tested by the long wait – and will set them up for a hefty price tag somewhere in the midst of the two-year contract they’ll sign, when inevitably, a better iPhone *will* come out. I think that’s really Darrell’s point: the roar of the approving crowd is likely dampening that voice of reason that tells you, “Verizon’s iPhone is dated technology, and something better is around the corner.” How far around the corner? Probably only Steve and Jonny know. The iPhone to wait for will be the iPhone 4G, operating on Verizon’s LTE network – but that’s not going to drop in June. My personal solution? I took a freebie Nexus S (buy yours or similar late-model Android from an aforementioned, foaming-at-the-mouth fanboy on ebay), got a no commitment, $40/month unlimited data + 400 minutes of voice plan from T-Mobile, and use it to supplement my Verizon plan, which I stripped down to the minimum. Together with Google Voice and Nexus S IP calling from wifi, even this dedicated Apple fan can “make do” until the more rapid early adopters are done tripping over each other’s throats to get a carton of milk with an already-approaching past due date stamped on it. Don’t buy any piece of technology because a new version *may* come out soon. We don’t know when the next version of the iPhone is coming out, whether it will immediately be available for VZW customers, or if the features will even be that much more compelling. As a VZW customer who has literally suffered through piece of crap hardware for about two years now, I will be waiting in line for my VZW iPhone 4 on Feb 10th. As a VZW customer, you can get your iPhone 4 a week earlier! I see your point with regards to the age of the model, but realistically if the argument holds, it’s carrier agnostic. Don’t buy an iPhone because a new one is coming. Of course with a new model every year, you’re always going to be left out in the cold at some point because it’s all two-year contracts. For most people I’d say if you want the iPhone, get it now. While better battery life and more processing power is appealing it’s not going to be relevant to most of the populace. Their existing phones will suffice for their lifespan. NFC, while very cool, is an extremely small niche at the moment. One could make a stronger argument that you don’t want to a new iPhone this June because you’ll still have a year locked into a contract come next June when the upgrade that most people WILL care about which is the switch to 4G LTE. Simultaneous voice and data just doesn’t seem that important to me. I can’t imagine needing to do that. If I’m EVER on a phone call, it’s not very long. And I would have no problem saying “yeah, let me hang up and I’ll go order the movie tickets on Fandango (which I’ve never used) and i’ll text you when I get to the theater and we can meet up.” ya know? I mean, why in the world would I ever need to do something like that so badly that I must do it before I hang up? Overall, like all your articles, you confuse your *opinion* with facts, and your particular situation with everyone else’s (possibly differing) situations. For instance this entire article is written from the point of view of an AT&T “switcher” (presumably your situation), and ignores all arguments that could be made for someone who is either already a Verizon customer, or a customer of neither AT&T nor Verizon. Even though you present it as a guide to someone considering the Verizon iPhone, it’s really just a bunch of random thoughts off the top of your head about what *you* are going to do. Bad advice. Nobody knows if the iPhone 5 will be immediate for V customers. Plus, if you want to upgrade you can actually MAKE money on eBay selling the iPhone 4. No reason to wait any longer. Never *wait* on Apple products when you can get them today. On the contrary, Apple is always coming up with new editions to their products. They’re always finding ways to reinvent themselves to be better. I understand that you might as well not wait and just jump on it. But, a little patience can get all those kinks fixed with a newer model. Point taken, but I think you may have missed the point about network quality. If any one thing has hampered the iPhones already incredible success is the poor AT&T network. For many people, despite AT&T’s claims to the contrary, the AT&T network is all but non-existant. Poor service, droped calls, slow data performance are hallmarks of the AT&T experience for many iPhone users that have stayed with the iPhone desbite these issues. I think people are going to flock to Verizon just to get off AT&T’s network. The question is will they be disappointed once millions of AT&T slam the Verizon data network. “Leaps and bounds better” on the next version sounds like at good reason to wait, but how likely is that really. The iPhone 4 is very well developed indeed as a fourth gen device. For anyone that knows what it can do for you, there is no reason not to buy one now. It’s possible a new iPhone released June 2011 would not work with Verizon, given they’ve modified the original hardware. It may be more like January 2012, or, a Verizon release schedule instead of an Apple one. Andy according to the press conference they have been working with Apple during the past two years, which included one year of testing so I imagine the next hardware will already be CDMA ready and knowing Apple it is more likely that they will have a dual band phone as they like to keep their model line simple. We shall see in a few months. The fact that there is no exclusivity with Verizon also hints at the possibility that you may be able to activate these on other carriers at some point.